Our classes teach traditional Shotokan basics, kata (forms), kumite (sparring) and kobudo (weapons). Kata is a set sequence of basic karate moves organized into a pre-arranged fight against imaginary opponents. It consists of kicks, punches, sweeps, strikes, blocks and throws which become increasingly more difficult and sophisticated as a student progresses through the belt rankings. Kumite is the practical application of kata to real opponents. Students may begin sparring classes when they achieve the rank of yellow belt. Kobudo is the use of a weapon applied in a kata sequence. Pride Dojo teaches two weapons, the bo and Kai-bo. Students will learn how to follow instruction, develop balance, coordination, strength and concentration through appropriate game playing. They will be taught listening skills and will gain self-confidence through creative activities, while engaging in a fun and exciting environment. Students will improve coordination, power of concentration, and balance while learning kata and sparring actions. Continued growth in self-esteem and confidence building, as students broaden their abilities and knowledge of the martial art. The skills obtained in this class will help enhance your childs’ abilities in school, sports, and other outside activities. 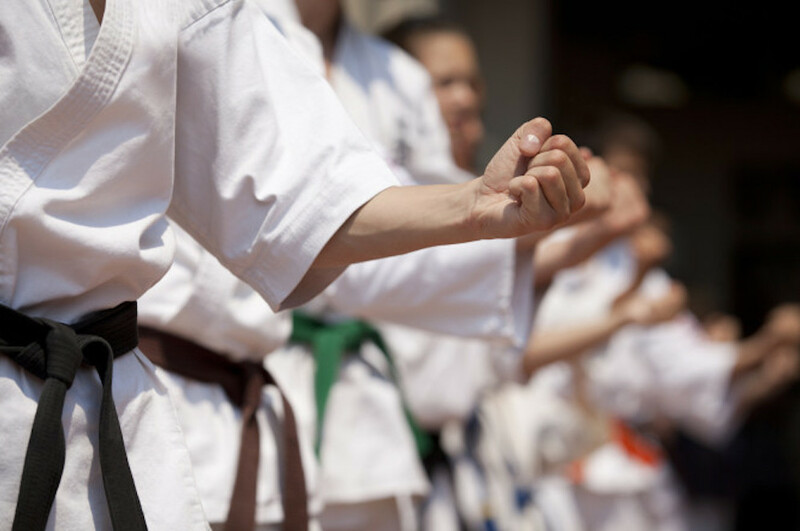 Training in karate offers many benefits to becoming a whole individual. Self-defense skills, physical fitness, mental as well as physical challenges, and a connection to others in this age group are principal goals at this level. Karate training is an excellent means to keeping your mind-body connection and keeping multi-tasking skills sharp and focused. It releases tension, improves balance and agility and improves both health of mind and body. This class is designed for any age and any level of physical fitness. This is for students that have a rank of yellow belt or higher. Kobudo means weapons in Japanese. We work mainly with the bo staff, which is a long wooden staff. In this class students are taught Katas with the bo. Katas are a series of movements with attacks and counters against imaginary opponents. This class prepares students who are interested in competing in tournaments in the kobudo division. The bos are provided in the class. This class is for students that have a rank of yellow belt or higher. Sparring is a controlled fight with safety equipment. Students learn how to block and counter with a partner. The class teaches offensive and defensive techniques. Students start to learn footwork and how to hit targets. The class prepares them to participate in tournaments if they choose. Students enrolled in the class are required to purchase safety equipment. Colored belt ranks are used in karate to indicate experience, knowledge and seniority. Students begin as a white belt and advance through yellow, orange, blue, green, low purple, high purple, brown and black belt. After achieving a first level black belt, Shodan, students continue to progress as a Dan. Typically students earn Shodan in 10-12 years. Each rank is associated with certain kata(s), and sparring techniques that need to be perfected in order to pass to the next rank. A student must be invited by a Sensei to test for the next rank, which may occur a few times a year in the lower ranks, and only 1-2 times a year for higher ranks.